I've mentioned I love going to hear live music. This isn't just limited to musicals or to concerts - I like classical music too, and love to check out the Symphony. Pittsburgh has a amazing symphony, and in recent years, they've started to expand their lineup. 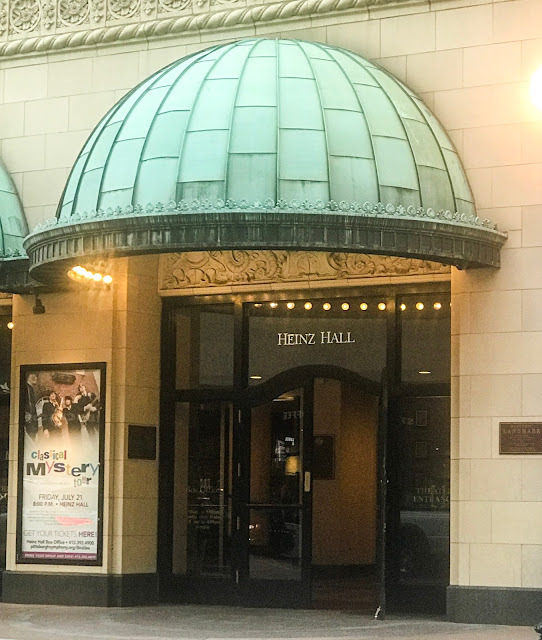 They have something called the FUSE series, where they do mash-ups of classical and current music, held at Heinz Hall in downtown Pittsburgh. It makes for a really fun concert - it's a bit more laid back than a traditional symphony show; they have a happy hour beforehand at the theater, and the energy during the concert is a lot lighter! At the FUSE concert I went to last week, they didn't focus on one particular current or classical artist, they did a whole bunch of different mash-ups - Vivaldi mixed with Britney Spears, Mozart with John Legend, Mahler with Bittersweet Symphony by The Verve. You can check out a video of them performing their version of Bittersweet Symphony here - it's one of my favorite songs and I think this version is beautiful! The group that they brought in to play with the symphony, Time for Three, was incredible! They were so passionate about their performance, and looked like they were having the best time. They really made the show so enjoyable, and they were clearly very talented artistically. They seemed to love what they were doing, and made the audience love it, too. If you ever get the chance to check out a similar concert in Pittsburgh or your own city, I highly recommend it!